There's 8,760 hours in a year. If you're like most people you work a minimum of 40 hours per week and I'll assume there's another 2 hours per day that you spend on either getting ready for work, commuting to work, or de-stressing from work. That's 50 hours per week minimum that is likely devoted to work related activities or 2,600 hours per year. A minimum of 30% of every year once you reach working age until you retire is devoted to work. I think it's quite obvious that we should all find a way to cut that down. Just imagine what you could accomplish and how much healthier your life would be if you could find a way to support your lifestyle on the income that your investments provide. That 2,600 hours per year that we spent working could now be devoted to something, anything. Malcolm Gladwell wrote in "Outliers" that it takes 10,000 hours to become a master of something. Using just the time that you used to spend working you could potentially become a master at anything in less than 4 years. Many of you that visit my blog are pursuing financial independence just like my wife and I. The concept of financial independence largely springs from a desire for freedom. Freedom to travel. Freedom to more fully develop relationships. Freedom to raise your children yourself. Freedom to pursue causes you're more passionate about. Freedom to not HAVE to work. Once you're financially independent you effectively own your own time. Forever. While we all agree that financial independence is a good thing; how exactly do you get there? Our strategy is dividend growth investing. Dividend growth investing entails investing in companies that pay and increase their dividends on an annual basis. That typically means investing in the "best of breed" companies within their respective industries. Companies like Hershey for the chocolate lovers, Johnson & Johnson and Becton, Dickinson & Company for health care, Pepsico and Coca-Cola for beverages, Colgate-Palmolive for personal care products, Clorox and Procter & Gamble for household goods, ExxonMobil for energy, V.F. Corporation for clothing. The list goes on and on but what all of these companies have in common is that they are titans in their markets. Dividend growth investing is an excellent strategy for financial independence seekers because of its basic nature. Dividend growth investing boils down to living off just the income that your investments provide each year. That leaves the principal in tact to continue the compounding machine and even better is that the companies should generally increase their dividends at a rate faster than inflation each year. That last fact is key to what makes dividend growth investing such a strong strategy. 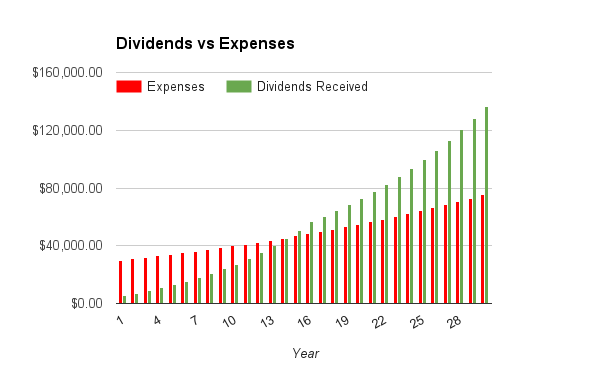 Each year you'll get a bump up in the total amount of dividends you'll receive that should exceed how much your expenses increase each year. It's a perpetual income generator that picks up steam each year. 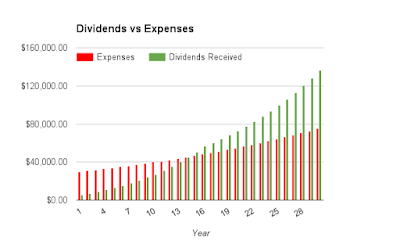 Last month I wrote about how your margin of safety, the gap between dividends received and expenses, will continue to grow with dividend growth investing, but I wanted to look at it from the other end. I don't think I need to sell any of you on the benefits of dividend growth investing but just how quickly can you expect to reach that elusive crossover point and move to being financially independent? Doing long term planning is rather tricky but it's vital to the process of becoming financially independent. To reach the "holy grail" of FI the key is to spend less than you earn and invest the difference. If you don't do that I can guarantee you'll never reach financial independence. So what information do we need in order to get a general timeline of the process? You need to know what your current expenses are and a forecast for inflation of those expenses. Inflation has been all over the place with some decades showing near 10% inflation and others actually showing negative inflation or deflation. However, it's been much more steady over the last 30 years or so coming in around 2.5%. 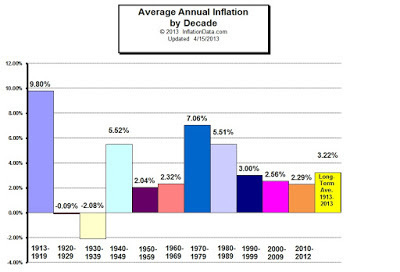 Between 1913 and 2013 it averaged 3.22% so we'll use that just to be conservative. Of course you also need to know how much savings or investment capital you'll have each year as well as the starting yield of your investment. Obviously the yield is a function of value at the time but if you use a conservative estimate between 2.5-4% that should be a "good enough" value to project. We're all savvy dividend growth investors so of course we need a dividend growth projection. The long term dividend growth for the market as a whole is around 6.5% so something in that range would be a good guess for what a diversified portfolio could provide. If you've already started on your financial independence and dividend growth investing journey then congratulations you've got a bit of a head start on someone that is just getting started. I've created a spreadsheet on Google sheets to help us run all of these calculations. You just need to input your values/estimates for current dividends you expect to receive over the next year, your starting expenses, inflation projections, annual investment capital, annual dividend growth, initial investment yield, and your desired margin of safety. There's a few assumptions used in the calculations that I need to cover. First the investment capital is made one time at the end of each year. That's likely not the way you'll actually invest your savings but it makes the spreadsheet much more concise. All dividends are reinvested at your initial investment yield rate. Once you reach your desired margin of safety you'll quit working which means you no longer have savings to invest each year so that will drop off. So will the dividend growth from reinvestment. The following graph shows the current projections for my wife and I. Unfortunately it looks like we still have around 14 years until we can reach our margin of safety. Of course this analysis does miss three big things. First it assumes that your investment capital won't rise over time when ideally any raises you get from your day job would go straight to investment capital. Second it doesn't account for any potential income that you would receive outside your investment portfolio, i.e. continue to work in another form or blogging/freelance writing or other side hustle. If you have other sources of income then you can pull in your FI date earlier but it's a bit hard to project that because while I earn a decent amount of income from blogging and writing on Seeking Alpha I have no idea what that will look like this year or next, let alone 5-10 years from now. The third thing that's missing is that cash savings and/or traditional retirement accounts could be used to further rein in your financial independence date. The journey to financial independence and dividend growth investing is far from a quick one. Without enacting severe austerity measures in your life you're likely looking at a minimum of 7 years if you're starting from scratch. Unfortunately due to expense creep and decreases in our income it looks like we still have a pretty long road ahead of us with about 15 years if we maintain our current path. Luckily though nothing is set in stone and we can always make changes to improve our situation. You can access the spreadsheet here and play around with the numbers for your own situation. You should also be able to save a copy of the spreadsheet to your own Google Drive if you have an account with Google. Have you done long range projections for reaching financial independence? How much longer do you have until you reach your financial independence date? Do you still plan to earn income in some capacity or will you only rely on the dividends you receive? I am curious where the 6.5% average long-term dividend growth number is from - what time period was it over? A quick scan over the US dividend champions list for 11 years+ companies had an average of 9.2% growth for the last 9 years.